Multiple payment gateways: accept payments via PayPal, Payza/AlertPay, Authorize.Net, Skrill/Moneybookers, BitPay (accept bitcoins) and InterKassa. Banner rotation feature: rotate several banners on the same spot without page refresh. Approval Mechanism: banners go online after admin approval. Show banners on 3rd party websites: plugin handles embed code (through iframe) that allows to show banners on 3rd party websites, example. Support latest WordPress version: plugin tested on WordPress 4.x. The best way to describe how the plugin works is to show live example. Click “Live Preview” or follow demo link. There is advertiser’s signup form. You can fill up this simple form and click “Continue” button. If everything is OK, system asks you to confirm provided information and redirects to appropriate payment gateway (PayPal, Payza/AlertPay, Authorize.Net, Skrill/Moneybookers or InterKassa) to complete the payment. After completed payment your banner will be included into rotation. It will be displayed during pre-paid period. At the end you get statistics by e-mail. Install and activate the plugin. 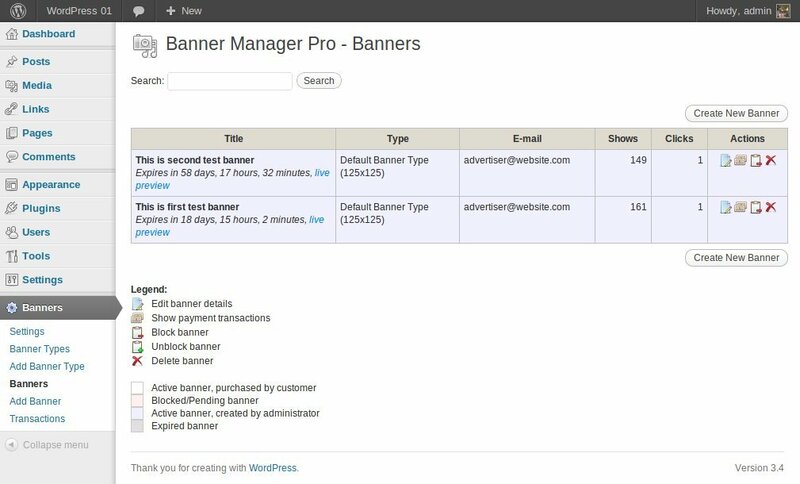 Once activated, it creates menu “Banners” in left side column in the admin area. Click left side menu “Banners >>> Settings” and do required settings. Set your PayPal ID, Payza E-mail, InterKassa, Authorize.Net, Skrill parameters, e-mail templates, etc. Please look at the screenshot to see what kind of settings you can do there. Create new page (or use existing one) and insert shortcode there: [wpbannerspublish]. This shortcode generates sign up form for advertisers. Click left side menu “Banners >>> Banner Types”. 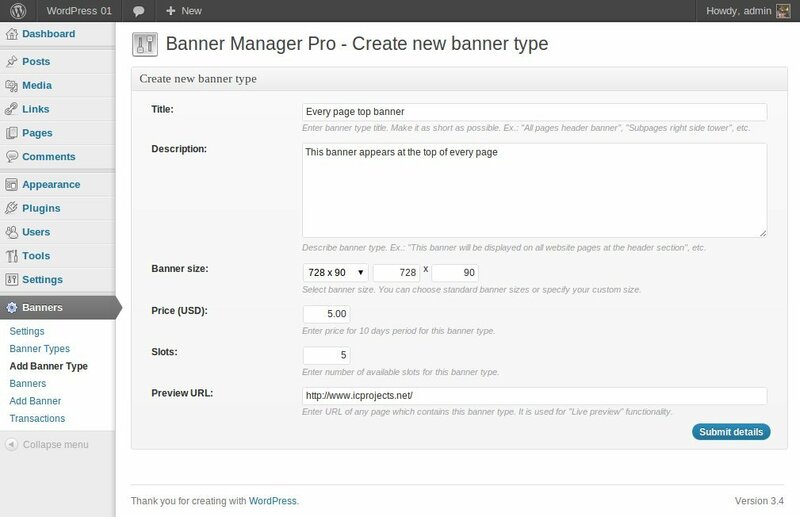 In this section you can create and manage available banner types. You must create at least one banner type. After banner type created, click “Embed codes” icon. As a result you see the popup window with different embed codes for this banner type. Edit your theme files (content, text widget, etc.) and insert one of these embed codes in those place where you wish to see banners.